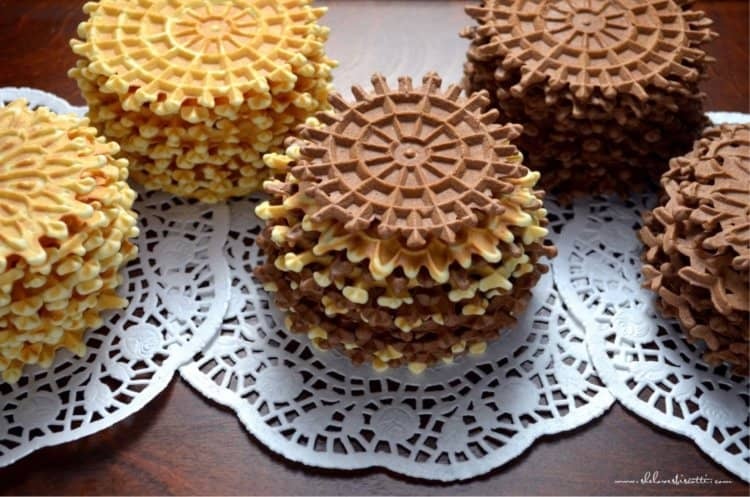 Home » Italian Cookies » Pizzelle della Nonna: A Classic Italian Cookie! Delicate. Thin. Crispy. Wafer like. 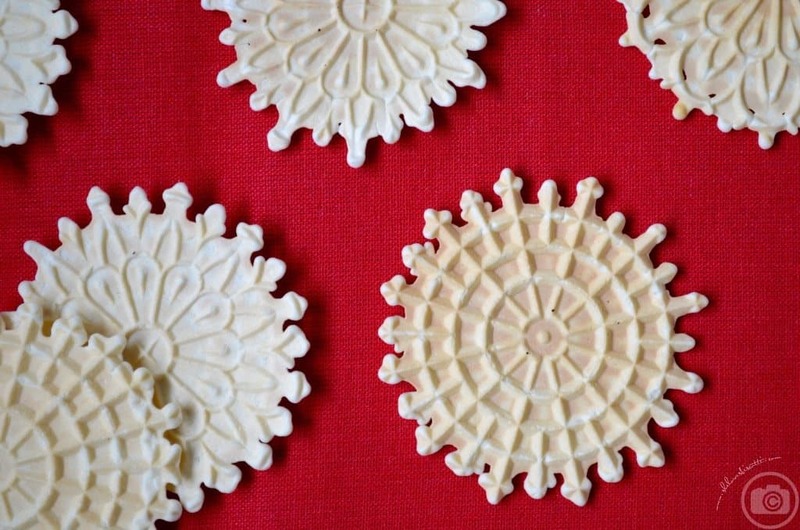 This is how I would describe this classic, authentic, Italian cookie: Pizzelle della Nonna. This easy, simple, no butter recipe can simply be flavored with vanilla, anise, or even chocolate. 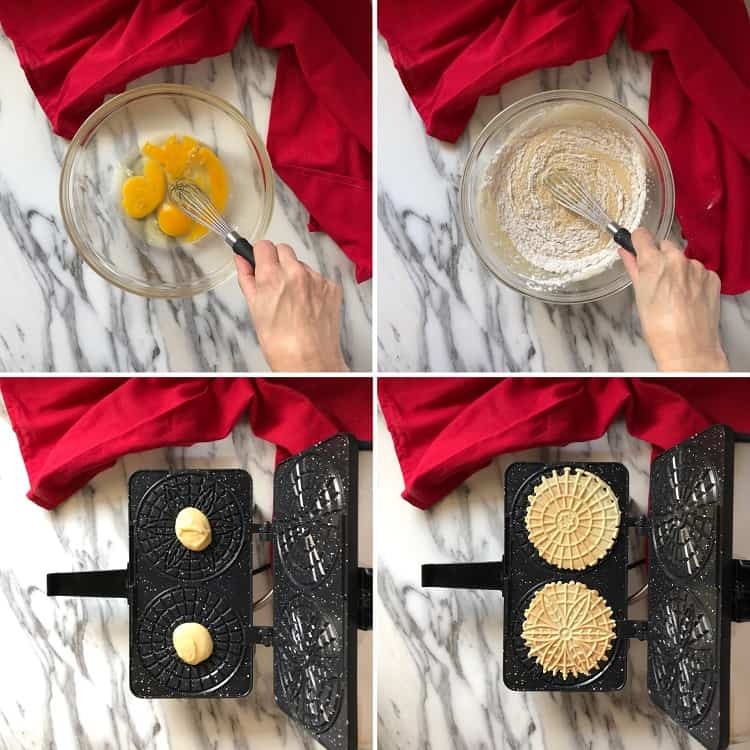 Your search for the perfect pizzelle recipe is over! This post was originally published on November 24, 2014 and recently updated with new content and a video. These highly recognizable Italian cookies get their shape by flattening the batter between two hot iron plates (just like waffles). These plates (rectangular or round) often had the pattern of the family crest engraved on them. Nowadays, the imprint of the pizzelle maker is a geometric/waffle design, a flower or even a snowflake pattern. What do I need to make Pizzelle? Eggs. An essential ingredient to make the best pizzelle recipe. Oil. That’s right! A pizzelle recipe with oil. Essence. A traditional pizzelle recipe includes anise, but there really are so many options! The quantities and the type of fat used will determine the texture and thickness of the pizzelle; and as for the flavoring, it really is a question of taste. My personal preference is the flavor of my childhood, vanilla and anise. 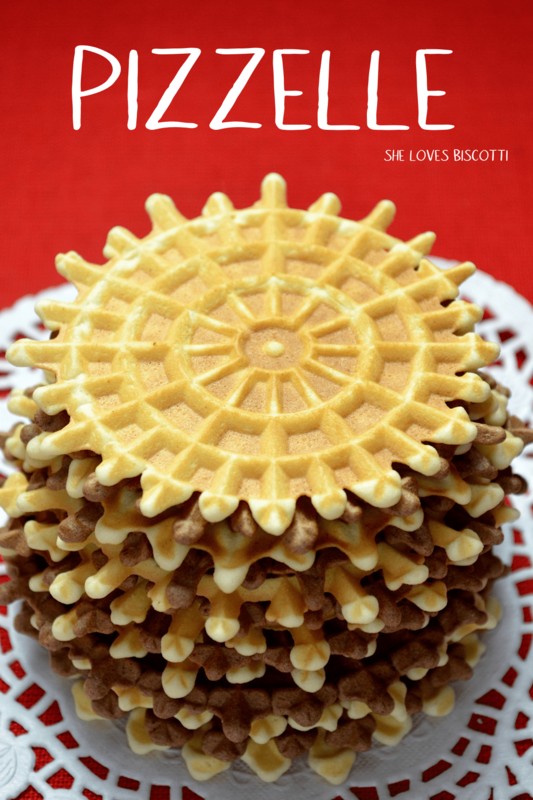 Let me show you how this Italian cookie recipe can easily be made with a pizzelle maker. Begin by whisking three eggs until they begin to thicken. Next, add the sugar and whisk until it is well incorporated. As you can see, I like to use my whisk. If it is easier for you to use your stand mixer, make sure to use the whisk attachment. Next, add in the oil and liquid extracts such as vanilla and anise. Moving right along, whisk in the dry ingredients which consist of flour, baking powder and salt. That’s it! The batter to make the perfect pizzelle is done. Now for the fun part! Heat the pizzelle iron and drop about one tablespoon of dough in the middle of each of the plates. Drop the upper heated element and in approximately 45 seconds you will have pizzelles. As individual pizzelle makers have different heating elements, consult your owners’ manual for specific times. When pizzelle are removed from the iron plate, they are extremely malleable. You literally have a few seconds to drape it over a bowl, or to wrap them around cannoli tubes to get your desired shape (cannoli, bowl, tulip, cone, etc great for custard or ice cream). Alternately, you can lay them flat. This recipe comes together easily in a bowl. Although there is no need to use a stand or hand-held mixer, feel free to use one if it is easier for you..
Can I make chocolate pizzelle recipe? Yes. Simply use 1 cup all-purpose flour sifted with 1/4 cup unsweetened cocoa powder (eliminate the anise flavor-only use vanilla). 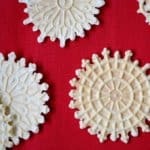 Can I make this pizzelle recipe with anise oil? Yes. Replace the amount of anise extract with ¼ teaspoon of anise oil. What is the secret to the obtain the perfect pizzelle that stay crispy? once all the pizzelle are done, allow them to air dry for a few hours. How do I store pizzelles so that they stay nice and crisp? Pizzelle stored in this manner will keep well for a few weeks. Whatever you do, do not place them in plastic or airtight containers (like Tupperware) as the will get soft. Have you ever noticed that with time, the anise flavor intensifies in pizzelle? That’s why they are such a great cookie to start your holiday baking with. In my nonna’s Italian dialect, these simple cookies were referred to as “ferratelle”. My dad’s mother was born in Ripabottoni, in the province of Campobasso, in the Italian region of Molise. I have so many fond memories of my mom and my grandmother making these special treats, especially at Christmas. I can remember eating pizzelle faster than they could make them. Back then, my mom and grandmother would make the “ferratelle” one at a time, with a stove top press with long handles. In fact, I still have it and it is pictured above. Imagine the afternoons spent making pizzelle when the basic recipe called for one dozen eggs…a dozen!!! This authentic Italian pizzelle recipe was made religiously every two weeks. Would you like to know my nonna’s secret to perfect pizzelles? She stored them in a bread box which was placed in the pantry. There was no bread in that box – only pizzelle. There were probably near a hundred of them, all stacked up, ready to be eaten as an after school snack or placed on the table when family and friends came over. They were the crispiest pizzelle! 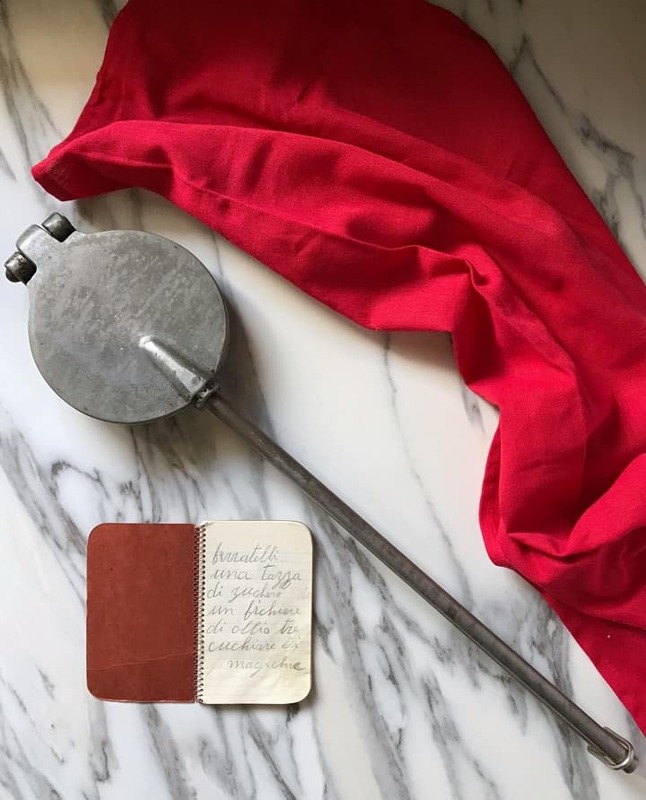 When my grandmother passed away, we found a small notebook which had some recipes written in it. It is remarkable to me that a woman, born in 1908, in a small village, in the middle of nowhere, learned to read and write. This little booklet symbolizes so much more than recipes. 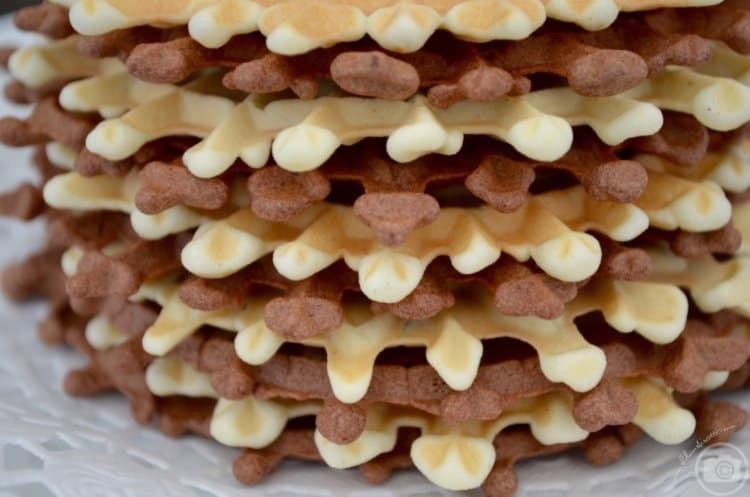 ★★★★★ If you have made this Pizzelle recipe, I would love to hear about it in the comments below and be sure to rate the recipe! Have you ever wondered how to make pizzelle? Come and take a look. This crisp Italian cookie recipe requires no butter and is so much fun to make! In a large mixing bowl or the bowl of an electric mixer fitted with the whisk attachment, beat the eggs until frothy and beginning to thicken (about 3-4 minutes). Add sugar. Continue to whisk until well thickened. Add the oil and extracts. Mix well together. Slowly add the flour mixture until well combined, dough will be soft and sticky. Drop 1 tablespoon of batter on hot pizzelle press. Close lid and cook 30 - 45 seconds or until slightly golden. Remove from press with the help of a fork. Transfer to flat surface or mold into desired shape. Special Equipment needed to make this recipe is a pizzelle iron. To make chocolate pizzelle use 1 cup all purpose flour sifted with 1/4 cup unsweetened cocoa powder (I do not use the anise flavor-only vanilla). We love the vanilla and chocolate versions. I added 1 tsp of cinnamon to the vanilla batter and they are delicious as well. Sounds like a great variation Marjorie. Thanks so much for taking the time to comment. Thank you so much for sharing this recipe. My parents made pizzelles often with the original stove top iron. My dad passed away a year ago and my mom suffers from Alzheimer’s and unfortunately they didn’t document recipes – it’s was all from memory. My family was missing these special cookies. I tried this recipe and it’s just like the one I grew up with. We have the original iron but use it rarely due to the time commitment required. The electronic version is not quite the same but close enough. Thank you for helping me bring the tradition back. I’m so sorry to hear about your loss Maria. Caring for a loved one is not easy… sending you hugs. I am so happy that the pizzelles taste like the recipe you grew up with. I just LOVE these. When I finally bought my pizelle maker I was on the hunt for a great recipe and found yours…absolutely delish and so super easy. This recipe is phenomenal for my lactose intolerant friends. They love it that I can offer treats for them. I can make so many varieties, chocolate, lemon but my fave is vanilla. Thank you , thank you for posting this recipe…it is a keeper! Hi Andrea. I felt the same way after my mom’s Vitantonio pizzelle maker died on me. I bought another make but it is not the same. I am hopeful to find one in a local garage sale, the ones on ebay are very pricey. If I find anything online, I will write back to you. Thanks Andrea.